Showcasing beautifully shaped arms crafted from rattan poles, this dining arm chair makes a stunning statement in any dining space. 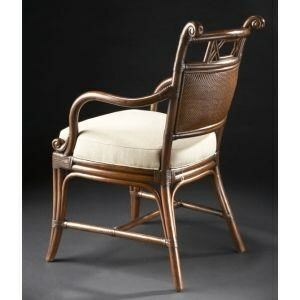 The chair has a distinctly tropical look and feel with its woven back and leather wrap detailing. An upholstered seat promises comfort and pairs with the Tobacco wood finish to create warm, natural tones. The Dillingham III Dining Arm Chair at C. S. Wo & Sons Hawaii in the Hawaii, Honolulu, Oahu, Hawaiian Islands, Waikiki, Diamond Head, East Honolulu area. Product availability may vary. Contact us for the most current availability on this product. Browse other items in the Dillingham III collection from C. S. Wo & Sons Hawaii in the Hawaii, Honolulu, Oahu, Hawaiian Islands, Waikiki, Diamond Head, East Honolulu area.